Yet another classic comic book cover. Here's a typically eye-catching and atmospheric Batman cover by Neil Adams. The story inside is equally cool. 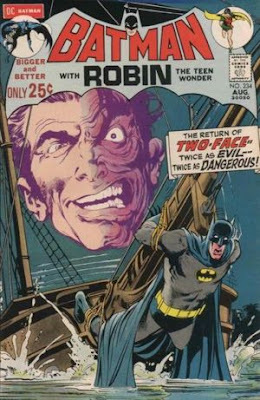 Published in 1971, it featured the first important appearance of the villain Two-Face in a number of years. Typical of many of the issues written by Denny O'Neil during this time, it was a well-constructed mystery in which Batman gets to show off his detective skills, his fighting skills, his escape artist abilities and his understanding of the psychology of his opponents. O'Neil was particularly good at jamming a lot of plot elements into a single issue and still create a smoothly flowing narrative. The 1970s were the golden age of team-up books. DC had already been showcasing Batman in The Brave and the Bold, teaming up with various other heroes, for some years. In 1978, they added DC Comics Presents, featuring team ups with Superman. 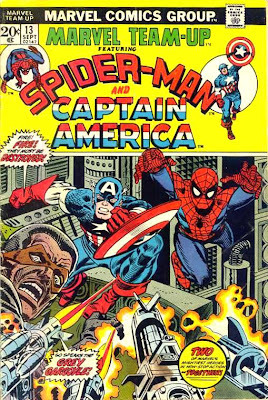 Over at Marvel, Marvel Team-up, almost always with Spider Man, started in 1972. 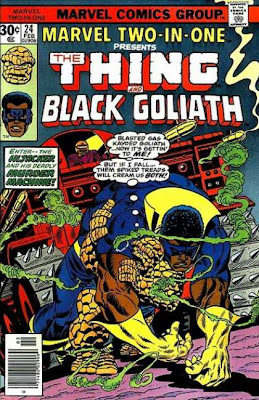 Marvel Two-in-One with Ben Grimm (the Thing from the Fantastic Four) started a year or so later. Why use these specific characters to headline the team-up books? Well, at DC, the decision was obviously based on popularity. Superman and Batman were their hottest properties, so books featuring them would sell well. And it was fairly believable that they would team up often with other heroes. Superman was so powerful you would often wonder why he needed help, but his Boy Scout personality meant he could work smoothly with most DC good guys. Batman in the late Silver Age was scary to the bad guys, but perfectly capable of making friends—or at least allies—with other heroes. At Marvel, popularity was probably the determining factor as well. But Spider Man and Ben Grimm both also have qualities that make them ideal for starring in team-up stories. Both have strong personalities and senses of humor. Both characters “play well” with others and aren’t overshadowed by more physically powerful allies. Another strength of the team-up books was that their storylines were always separate from the regular Superman/Batman/Spidey/FF books. Nothing in them violated continuity, but you could read any of these books independent of the main titles and still get a complete story. Regardless of what multi-part epics might be taking place in Detective, Action or Amazing Spider Man, the team-up books would remain a world of their own. Since most of the plots were wrapped up in a single issue, they gave you a nice little superhero fix whenever you needed it. The story, written by Bill Mantlo and Jim Shooter and drawn by Sal Buscema, isn’t groundbreaking in any way. But it tells the story well and gives Ben some nifty one-liners. It’s fun to read, which is all that is expected of it. The same can be said for Marvel Team-up #13. Spider Man stumbles across Captain America fighting a horde of AIM agents. Spidey jumps in to help, but as soon as the battle ends, the two heroes are teleported up to the SHIELD helicarrier. Bringing up Spidey along with Cap was an accident and a rookie SHIELD agent tries to arrest the webslinger. Nick Fury puts a stop to that, allowing Spider Man and Cap to work together in stopping the Grey Gargoyle from sabotaging a guided missile test at Cape Kennedy. This one was written by Len Wein and featured the always wonderful art of Gil Kane. Once again, there’s nothing particularly special about the issue other than it was just plain entertaining. The bit where the overeager SHIELD guy tries to arrest Spidey is priceless, as is a scene a few pages later where Nick Fury lays a patriotic guilt trip on Spidey to get him to agree to help. The action is well-handled and it’s all perfectly satisfying. 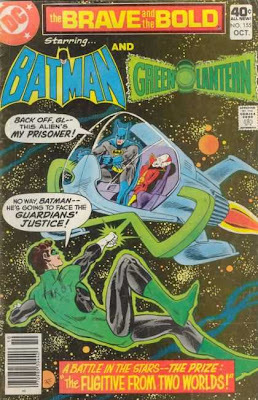 Over at DC, Batman and Green Lantern work both against each other and together in The Brave and the Bold #155. An earthquake rocks Gotham City and Batman soon deduces an alien criminal is responsible. Meanwhile, Green Lantern is assigned by the Guardians to capture the same crook for trial before the Guardians. This puts the two heroes at odds—Batman wants the villain to face Earth justice, while GL is determined to bring him to Oa. There’s some detective work that takes them both to another planet and it all leads up to a nice twist at the end involving the crook’s possible innocence. Written by Bob Haney and with Jim Aparo’s dynamic artwork, this is once again a story that is simply fun to read. Finally, we come to a story written by Cary Bates and drawn by Joe Stanton. In DC Comic Presents #10, Superman is thrown back in time by an enormous explosion while saving Paris from a terrorist threat. He ends up in World War II. Suffering from amnesia and unaware he has superpowers, Superman hooks up with Sgt. Rock and Easy Company. At first, Rock and the others suspect he might be a Nazi infiltrator, but he eventually regains his memory in time to secretly use his powers to save his new friends. Then, after faking his death to explain his sudden disappearance, he returns to the present. The plot here is a little contrived—it’s hard to do an “amnesia” plot without obvious contrivance. But tossing Superman and Sgt. Rock together is a nifty enough idea to cause us to forgive this. Once again—at the risk of sounding like a broken record—it’s a just plain fun issue. So that’s the simple truth—the various team-up books of that decade were not ground-breaking. They didn’t introduce innovative storytelling techniques. They didn’t change the face of the industry. They just used the established characters and backgrounds of their respective universes to tell enjoyable stories. And sometimes, that’s more than enough. Let's go hunt us some Jackalope!!! On a forum I frequent, someone reminded me of this excellent collection of short stories by Alan Dean Foster. The protagonist is a burly mountain man named Amos Malone, who learned something about magic and monsters during his lifetime and now puts that knowledge to good use while wandering around the Old West. Riding on his mount--a disguised unicorn named Worthless--Amos inevitably stumbles into one odd adventure after another. Foster's prose strikes a nice balance between straight adventure and tongue-in-cheek humor. In one story, Amos takes a skeptical British noble out to hunt jackalope, but the two men spend a wild night encountering a series of even weirder and more menacing creatures. Ghosts, dragons and ill-tempered shamans pop up in other stories. 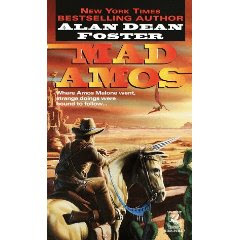 Mad Amos is an entertaining trip into a fantasy Old West, where legends and myth take flesh-and-blood form. I don't believe it's currently in print, but it's worth tracking down through an online used book dealer. Why doesn't anyone ever tell me these things???? Here's the deal with it: Roundabout 1939, special effects master Willis O'Brien (the stop-motion pioneer responsible for the original versions of The Lost World & King Kong) was planning on making another "lost world" type film. This one would involve an aviator who crashes in an isolated valley. In addition to the requisite dinosaurs, there would be a tribe of Vikings who ride giant eagles. It would have almost undoubtably been a fun movie and a visual delight. But real life in the form of World War II got in the way and production on the film was shelved. Somewhere along the way, whatever pre-production drawings and sketches "O'Bie" had were lost. 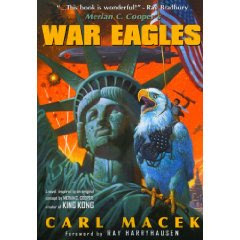 Ray Harryhausen later had had hopes of bringing War Eagles to life. 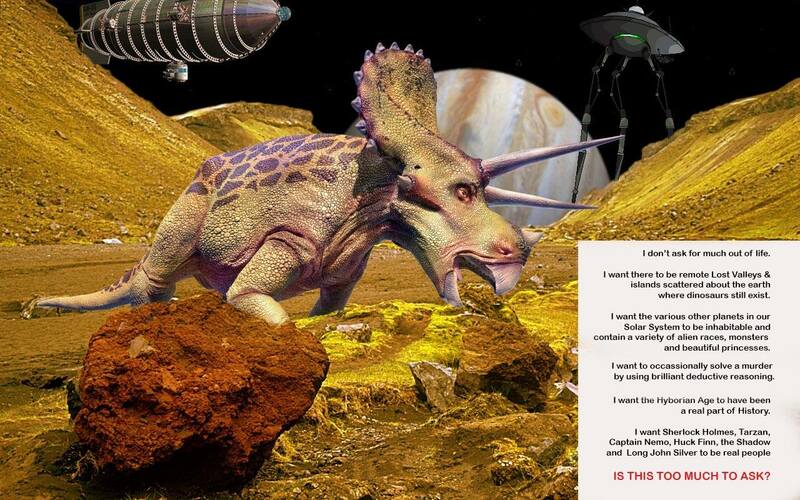 In fact, according to Mr. Harryhausen's web site, there is apparently still some hope of this happening. But whether we ever get to see the movie, at least we now have a novelization of the story. The author, Carl Macek, has worked mostly in animation as a writer, editor and producer. According to the Amazon.com customer reviews, he seems to have done a pretty good job in prose as well, penning an old-fashioned pulp-style adventure. I've sent away for the book, so I can judge for myself soon. None of the reviews specifically mention dinosaurs, though--so I'm a little worried they've been left out of this version. On the other hand, the story has been extended to include the protagonist using the War Eagles to battle a Nazi secret weapon, which is a cool idea. I really hope, though, that the dinosaurs are still there. No lost valley should ever be without dinosaurs. Gee whiz, why don't people TELL me about these things? A book about Vikings on giant eagles fighting Nazis (and dinosaurs?) and I almost missed it. During the 1950s, comic books remained a popular medium, but the superheroes that dominated the scene through the 1940s had pretty much faded away. Only Superman, Batman and Wonder Woman bucked the trend and remained in print. Most comics dived into other genres. There were Western, crime, science fiction, horror, romance, and humor comics. A lot of the output was mediocre, but there were some real gems popping up as well. EC Comics was a source of a lot of these gems. EC employed some of the best artists working in comics at that time and experimented with a wide range of genres. 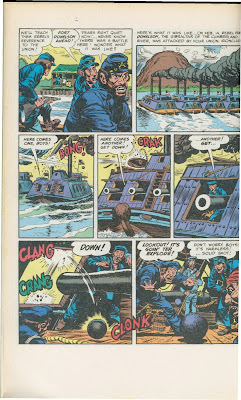 Pirates, soldiers, cops, and even psychologists all got their turn within the pages of EC's comic books. Today, EC is best remembered for their horror comics such as Tales from the Crypt. But I think the horror books are actually overrated. If I had to pick EC's best stuff, I'd turn to Two-Fisted Tales. Two-Fisted Tales started out as an adventure strip. Soon, they began to specialize in war stories--with most of them set in the then-current Korean War. But every once in awhile, the book would jump a little farther back in history to tell tales of past conflicts. 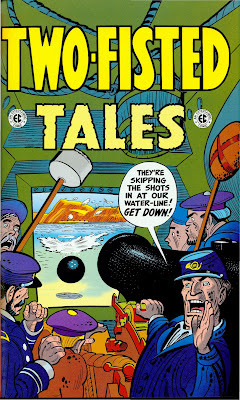 Two-Fisted Tales #32 (1952) concentrated on Civil War stories. Like most EC comics of the time, it contained four 6- to 8-page stories, each of which was a superbly illustrated and well-told story set during America's bloodiest-ever conflict. 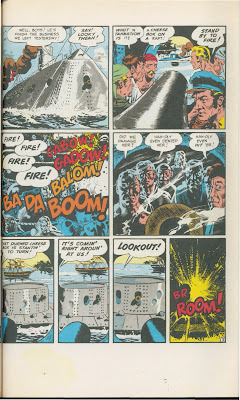 The first story, "Blockade," was illustrated by Wally Wood and recounted the clash between the Monitor and the Merrimac from perspective of the average crewmen. 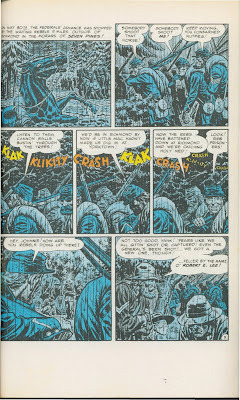 "Campaign," with art by John Severin and Will Elder, follows a platoon of Union troops as they slog and fight their way through the 1862 Peninsular campaign. 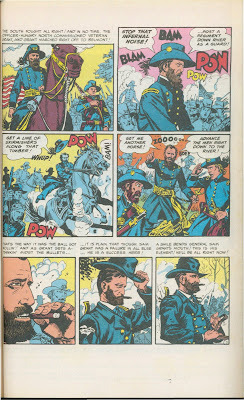 "Donalson" (art by Jack Davis) details the fight to capture Fort Donalson from the Confederates, recounting both the land and the river fighting. Once again, the story gives us the perspective of the average soldier. It's the last story--"Grant!" (art by John Severin)--that gives us the point-0f-view of a high-ranking officer. It's a short but effective biography of U.S. Grant, describing what was pretty much a failed life as a civilian before re-entering the Army to fight in the Civil War, thus placing him back in his natural element. All the stories are excellent--historically accurate with solid characterizations and well-choreographed action. Superheroes resurged to take over the market again a few years later. By itself, this wasn't a bad thing, since many excellent stories and characters came out of this genre. It's kind of a pity, though, that the variety in storytelling comics gave us in the 1950s seems to have disappeared forever. It must have been nice to stop at the newstand and have the option of returning to 1862 to fight the Rebs; or take a trip into deep space; or face off against a gunslinger on a dusty, tumbleweed-strewn street; or fight a giant crab deep under the sea; or even accompany Little Lulu on an 8-page slapstick adventure. Good times, indeed. This'll be the last of the Decade by Decade series. I originally planned to take it into the 1970s, but I'm ready to move on to something else. I've no idea what yet, but I'll think of something. 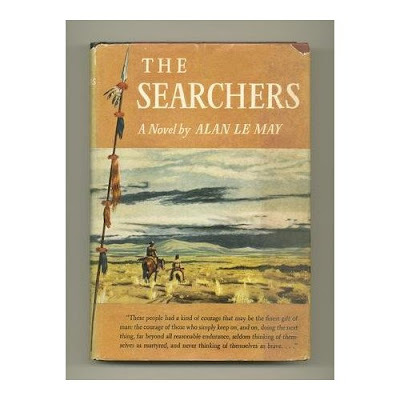 The Searchers, by Alan Le May, was published in 1954 and adapted into one of the best Westerns ever made by John Ford and John Wayne in 1956. In fact, The Searchers is one of the best movies ever made--period. But you know how in most cases, the original book turns out to be better than even a well-made movie adaptation? This is the case with The Searchers. Le May's novel has great characters, a tense and fascinating plot, and some of the most vivid descriptions of the terrain and weather of the American Southwest ever put on paper. As for the plot--well, it should be unnecessary to recount it, since anyone who hasn't at least seen the movie really should be taken outside and shot. It involves the kidnapping of a young girl by Comanches. Two men, Amos Edwards and Marty Pawley, begin a search to find her. Five years later, both men are still looking--determined to never give up. But their motivations are very, very different. Amos intends to kill the girl (his niece), because he knows by this time she will be more Indian than white. Marty, though, still wants to save her. The novel plays off this tension, coming up with a bit of biting irony at the climax (that is very different--in one key way--than the ending of the movie) that brings everything to an emotionally satisfying conclusion. Just as the movie is a great film (and not "just" a great Western), the novel is a truly great piece of real literature. I love genre fiction mostly because it gives us so many well-told stories without pretention to do more than that. But The Searchers does do more. Yes, the story is well-told, but it is also filled with real insight into human nature. What is particularly good is that the novel is just as unpretentious as are most other Westerns. All the elements that make it work--plot, descriptive passages and characterizations--flow naturally through Le May's vivid prose. DECADE BY DECADE, PART 12: "Keep Watching the Sky!!" In 1938, John Campbell published a novella titled "Who Goes There?" in Astounding Stories magazine. It was a wonderfully creepy story about an alien loose in an isolated Antarctic research station. The alien has the ability to assume the shape and memories of anyone it devours. By the time the humans figure out what's going on, they have no idea which of them is still human and which isn't. Eventually, the humans are able to think their way out of the situation (a common theme in Campbell's stories), figuring out a way to tell the humans from the aliens. When this story was made into a movie in 1951, pretty much all that was retained was the idea of an alien loose in a remote scientific outpost (now in the Artic rather than Antartic). The shape-changing stuff was dropped--instead, the alien becomes a virtually unkillable (but intelligent) monster that feeds on blood. Superficially, it may sound as if the movie makers had made a bad decision--dropping Campbell's nifty paranoia-inducing plot for a more standard monster-on-a-rampage story. But The Thing from Another World turned out to be a classic, using the narrow corridors and crowded rooms of the research station to generate a remarkable level of suspense. 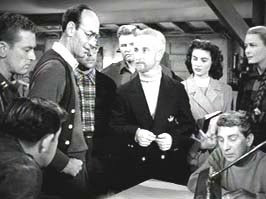 Solid acting by Kenneth Tobey (as an Air Force pilot forced to take charge of the situation) and Robert Cornthwaite (as a scientist who believes individual human life is less important that scientific advancement) also adds to the tension and gives the film a little bit of philosophical depth as well. A brief scene near the movie's climax, when Cornthwaite's character encounters the monster and begs it to share its knowledge, is key to the movie. Even those who have dismissed Cornthwaite's views as nuts for the entire film pause and wait for a few moments in the vain hope that he will succeed. But there's really nothing that can be done about the creature other than destroy it and, despite the sympathy doled out to Cornthwaite at the end, the movie supports this view whole-heartedly. Tobey and his men make plans then modify these plans as the situation changes, desperately trying to save not only themselves, but perhaps all of mankind. Despite the departures in plot from the original story, Campbell's theme of men using their intelligence to solve dangerous problems remains. The credited director is Christian Nyby, but most histories of the film claim that producer Howard Hawks actually did most of the directing. The rapid-fire and overlapping dialogue used throughout the film is certainly a Hawks trademark. That dialogue is another strength of the movie, helping to make all the human characters seem real to us and allowing the interjection of a fair amount of humor without distracting from the scary stuff. 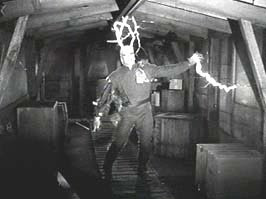 The Thing from Another World is a classic of the 1950s. It's scary without being gross. It's fun without losing its capacity to scare. DECADE BY DECADE, Part 11: "A U.S. 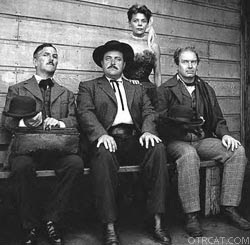 Marshal and the Smell of Gunsmoke"
Before it became a long-running TV show, Gunsmoke was on radio, with William Conrad playing Matt Dillon as a smart but sometimes fiery-tempered professional lawman. It was superbly acted, intelligently written and professionally produced. It is arguably the best Western to come out of old-time radio. "Home Surgery," a episode from the first season, stands out even among the many excellent stories the creative staff of Gunsmoke gave us. Dillon and his deputy Chester are heading back to Dodge City when they find an injured man at an isolated ranch. The man's leg is badly broken and infected. It has to be amputated, but there's no time to get a doctor. By the 1950s, radio actors, directors, sound effects men, and writers had really perfected their crafts. Radio drama at this time was at its best and "Home Surgery" is a prime example of this. It's really too bad that by this time people were turning away from radio to lose themselves in the vast wasteland of television. Decade by Decade, Part 10: SHAZAM!!! Captain Marvel Adventures #100 (1949)"Captain Marvel Battles the Plot Against the Universe"
Often in comics, a writer's unique story-telling style is perfectly complimented by a specific artist. We see that with Bob Finger and Bill Kane in the early Batman stories; with Stan Lee and both Kirby and Ditko in the 1960s; Denny O'Neil's Batman stories with Neil Adams art from the '70s should probably be on the list as well, as are the Sgt. 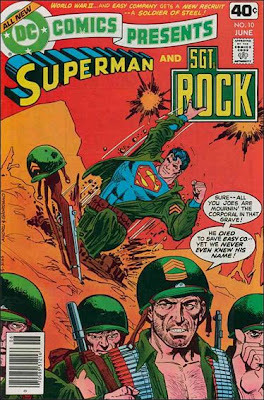 Rock stories of Bob Kaniger and either Joe Kubert or Russ Heath. In 1941, Captain Marvel creator C.C. Beck needed someone to take over the writing chores for his popular character (while Beck himself still handled most of the art). He found Otto Binder. 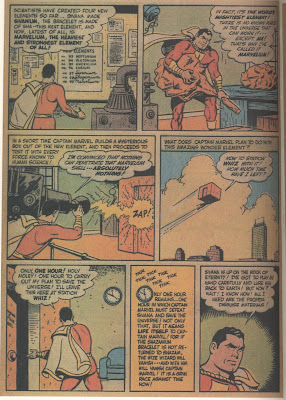 Binder (who later helped form a lot of the Silver Age Superman mythology) understood the light-hearted feel that worked best in the Captain Marvel Universe--magic and pseudo-science were casually accepted as a part of that Universe without the need to worry too much about "rational" explanations for it all. It all meshed perfectly with with Beck's visual style. To quote from the Smithsonian Book of Comic-Book Comics: "Beck's graphic renderings were simple, uncluttered, cartoon-oriented, and appropriately humorous." In 1949, to celebrate the 100th issue of Captain Marvel Adventures, Binder and Beck jammed a true epic into a single issue. 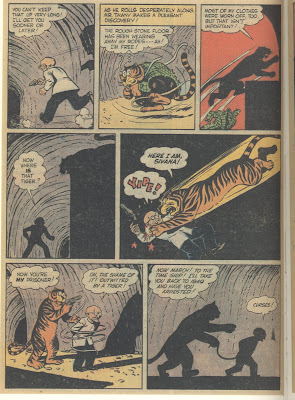 The evil Dr. Sivana kidnaps Tawky Tawny ("the well-known talking tiger") and steals his memoirs. From this, he learns how Billy Batson gained the power to become Captain Marvel. He goes back in time to stop Billy from meeting the wizard Shazam, but Tawny escapes and knocks him out, foiling this plan. 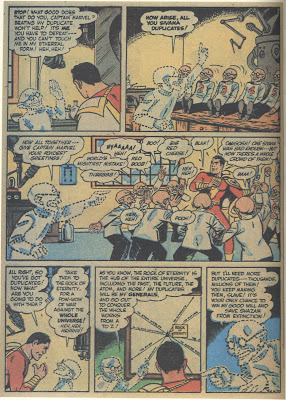 But Sivana also learns that Shazam wears a bracelet made from the metal Shazamium, which allows the now-dead wizard to appear as a ghost without fading away into nothingness. Sivana manages to steal the bracelet. Shazam now has only 24 hours before fading away. But Captain Marvel also builds a duplicate of himself out of Sivanium to build the Sivana robots, giving himself time to quickly invent a metal called Marvelium, stronger and denser than anything else. He builds a room out of Marvelium and tricks Sivana into entering. 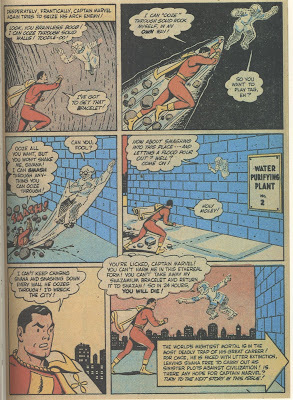 Not even incorporeal beings such as Sivana now is can pass through a Marvelium wall, so Captain Marvel is able to take the Shazamium bracelet away from Sivana and return it to Shazam in the nick of time. In the meantime, the Sivanium duplicate Captain Marvel and the Sivanium duplicate Sivanas have destroyed one another. It's an astonishing amount of storytelling for a 23-page story. And it's all incredibly entertaining, maintaining suspense while following its own bizarre but consistent logic tbroughout. The Captain Marvel Universe was a quirky, fun place--unpretentious in a way with which many modern superhero comics (obsessed with angst and "realism" as they often are) have lost track. DC Comics long ago acquired the rights to all these Marvel Family characters and incorporated them into the same universe as Superman, Batman and other traditional DC characters. This was, I think, a mistake. I don't think the Marvel Family characters has ever fit all that comfortably within the regular DC Universe. Beck and Binder gave them their own unique "feel," something that exists better on its own than after its been diluted into something else. But, of course, the old stories still exist and many of them have been reprinted in recent years. The Marvel Family universe is still there for us to visit whenever we want to have a good time. Decade by Decade, Part 9: "We don't need no stinking badges!" The Treasure of the Sierra Madre (1948) is a perfectly balanced movie. Everything that happens in it is both a necessary, well-told part of the narrative and also a part of the growth (or degeneration) of one or more of the characters. The script and acting in this movie mesh perfectly. There's not a lot of action (though the fight with the bandits is exciting), but there's a lot of suspense inherent in wondering which of the three main characters--prospectors who have struck a rich vein of gold in a remote mountainous region--will give way to greed and--perhaps--murder. Humphrey Bogart, Tim Holt and Walter Houston--dirty and unshaven through most of the movie--make a wonderfully realistic trio. Bogie is particularly good, giving hints to the shallowness of his character throughout the early part of the film before finally giving way to all his worst instincts. The movie balances out both the brutishness and the occasional flashes of nobility that are both a part of human nature. And it tells a really cool adventure story at the same time. Directed by John Houston and photographed in beautiful black-and-white, Treasure can be considered a film noir. Most noirish films have an urban setting, with dark alleys and dingy hotel rooms often being used to generate a claustrophobic feeling--a sense that the characters are trapped in whatever dangerous situation besets them. Treasure is set in the wilderness, but still has that same trapped, closed-in feeling. We get a few wide shots of the surrounding mountain region when the characters are searching for gold in order to establish the setting. But once they begin mining, the movie is staged in such a way to remind us that the prospectors are pretty much stuck together in a fairly small area. It's yet another example of how perfectly balanced all the various aspects of the movie are. Treasure of the Sierra Madre is a superb film--well-worth watching if you've never seen it and well-worth re-watching even if you have seen it. There's so much to appreciate about it that it easily stands up to repeat viewings without losing any of its impact as either a great story or an exploration of human nature.